We, KoreanDogs.org, do not rescue dogs from Korea or anywhere else. We are a volunteer group that focuses our effort on campaigning to end the dog meat trade in Korea. However, rescuing dogs from the dog meat trade is not only an incredibly effective way to raise awareness about this issue, but also gives these poor dogs a chance at a peaceful, happy and loved life they deserve. SaveKoreanDogs.org(Korean Dogs Sanctuary, Nami Kim and her team) works to close down and rescue survivors from the dog farms/slaughterhouses. This organization is always looking for caring, loving homes in the US, Canada, UK and EU who will welcome these precious angels into their family. If you would like to inquire about adoption, find more information about the adoption process and see the dogs available for adoption, please click below buttons. Photo: SaveKoreanDogs. 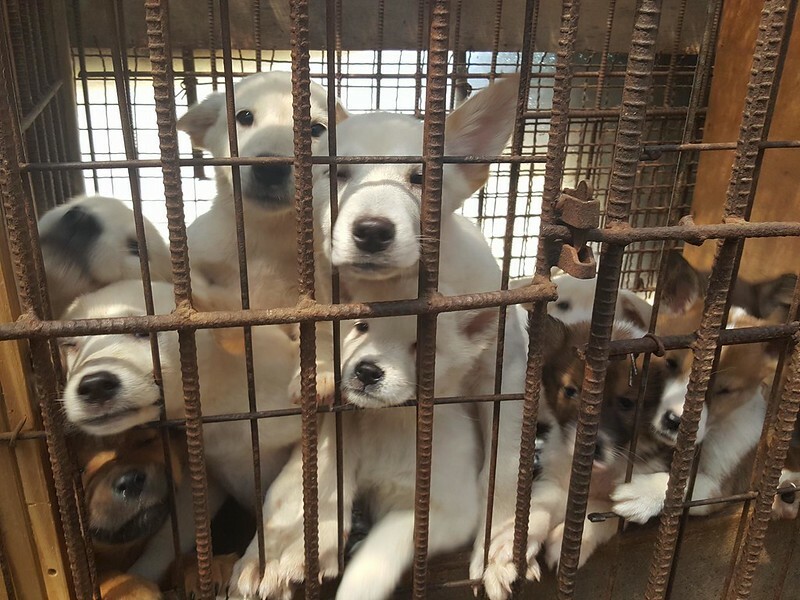 Puppies saved from dog farm in Bucheon by SaveKoreanDogs. Yes we may eat beef and chicken in the west, but the Bible says that it is not lawful to eat unclean meats, which includes dogs and cats. These animals are meant to be companions. these puppies and their parents deserve a loving family where they can live a life they were born to have,how low life can kill and eat dogs and cats is beyond understanding.let us hope that these barbaric killings and consuption of meat from this and all other countries that take part get stopped with haste. Please stop torturing these innocent and sensitive animals. Cant understand how anybody can do that. It is disgusting. If only these monsters could understand the purpose of animals! They don’t care and they never will.